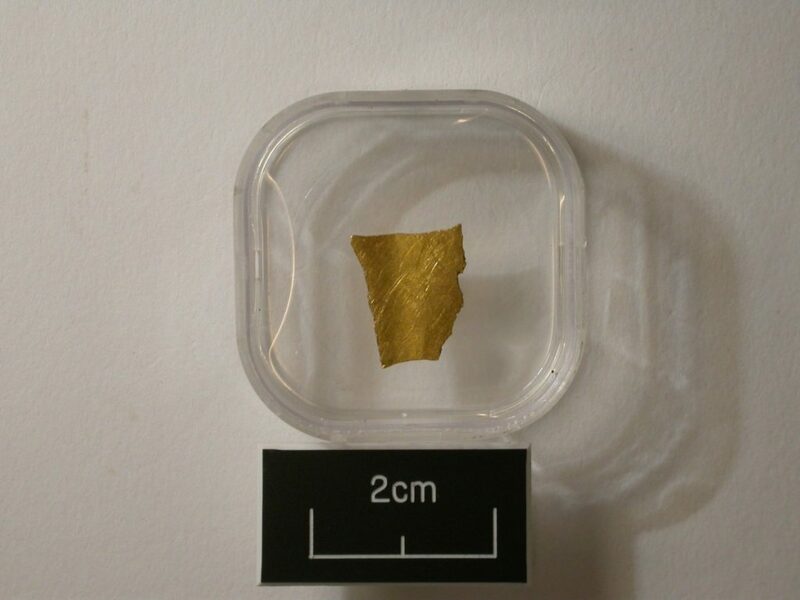 In 2002, a metal-detectorist recovered a piece of decorated gold sheet from a field on top of a hill in the St Erth parish. It was suspected this piece was Bronze Age which prompted the detectorist to return to the same field in 2003. In doing so he made not one, not two, but three more remarkable discoveries! 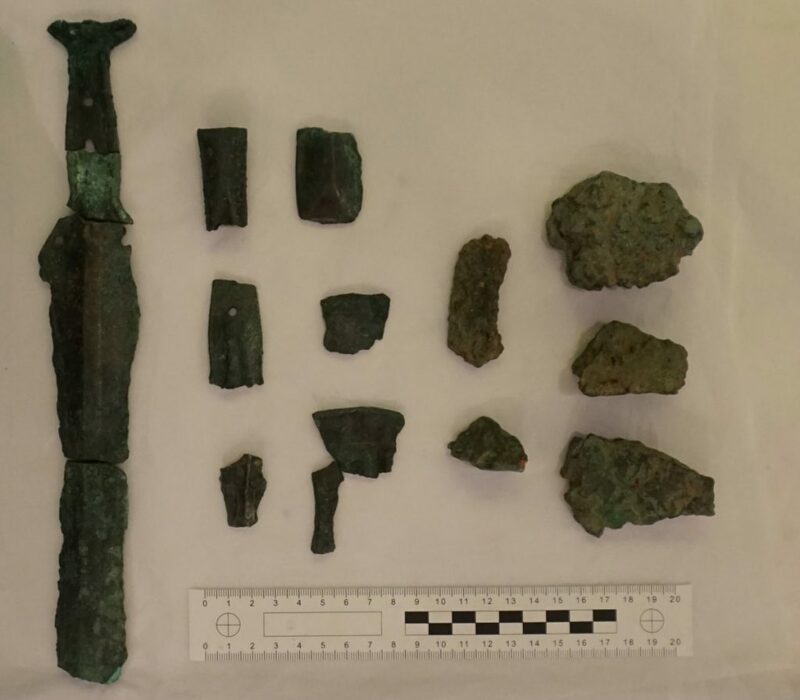 He recovered another, smaller, fragment of gold and two Bronze Age hoards of copper and bronze objects, altogether totalling over forty artefacts! The hoards contain artefacts that are three thousand years old, dating to the Late Bronze Age, around 1000-800 BC. 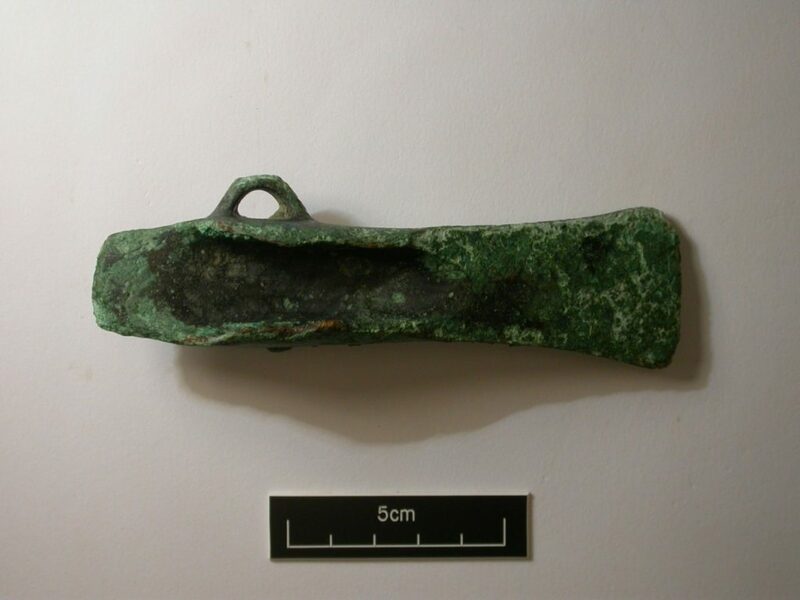 It is unusual to find so many Bronze Age objects buried within the same field and it is possible this location was very important to the communities that lived in the area in prehistory. The first hoard contains 22 incomplete objects broken into 27 fragments. These objects include two swords, two axeheads, a woodworking gouge, a possible knife and lots of fragments of raw ingot metal and waste from the casting process. All of the objects are broken and missing significant parts (though this is common in Late Bronze Age hoards!) One of the swords is represented only by the hilt and part of the blade, broken into four refitting fragments. Experiments with replicas have shown that this must have been done deliberately by putting the sword in a fire and striking it with a blunt object, such as a hammer. The other objects were probably broken in a similar way. The other sword fragment is part of a type called Gündlingen. As the name suggests, this sword is most common in Central Europe, though about fifty examples are known from Britain, as well as others from Ireland. However, examples are pretty much unknown from South West England with the St Erth fragment indicating previously unknown influence. A complete example was found off the coast of Sennen. The second hoard includes 17 objects, all of which are broken ingots apart from one complete axehead. This axehead is known as an ‘end-winged’ axehead, so called because of the ‘wings’ at the hafting end, which would have helped secure a wooden handle. This type of axehead is rare in Cornwall and is more commonly found in north-western France. It is difficult to know what to make of the two pieces of gold. One fragment is so small, it’s impossible to tell what it once was. The other piece is decorated and folded up, but is incomplete. Analysis of the gold indicates that these pieces could date to the Bronze Age but at present we don’t examples of similar objects. 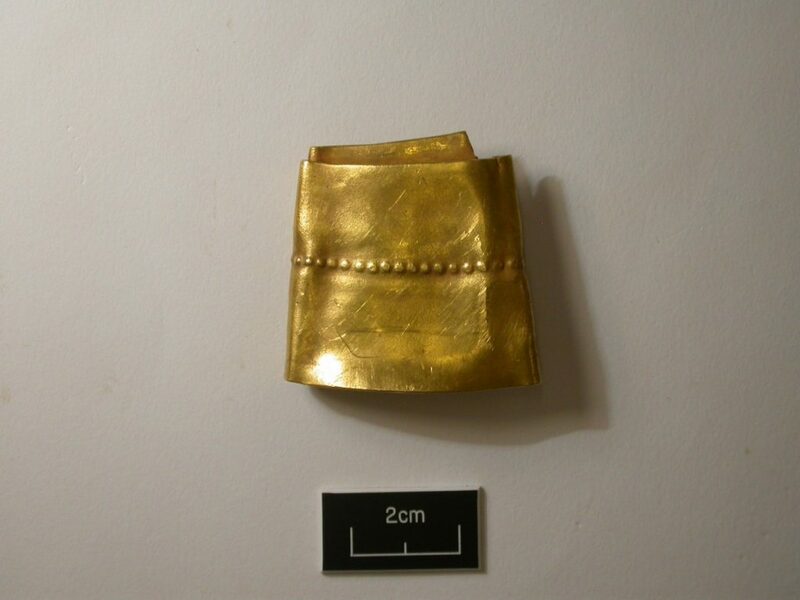 Gold in the Bronze Age was largely used for jewellery, including earrings, bracelets and neckrings. The gold objects from St Erth were probably used similarly. Why was all this buried in a field in Cornwall? Bronze Age people liked to bury stuff. There are literally thousands of Bronze Age weapons, tools and ornaments discovered every year from all across Europe. There are lots of possible reasons for this and it often depends on the specific circumstances of the objects, including where they were buried and how they were treated. Some objects were likely buried as offerings to the land or to deities. Other objects may have been buried as a form of storage or waste disposal. Typically, a hoard containing lots of broken pieces, like those at St Erth, would be considered a ‘scrap’ hoard. 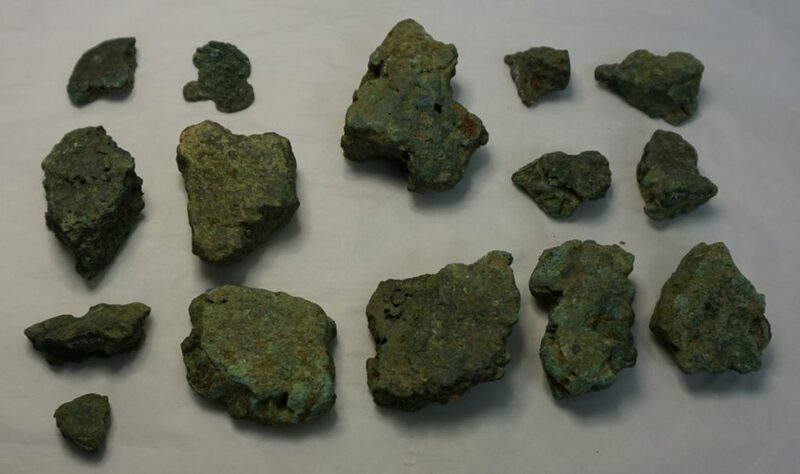 On the other hand, the large number of ingots could mean this hoard was a store of raw material to be melted down and cast into other objects. Both of these ideas could apply to the St Erth hoards, but it is also possible they had a symbolic purpose. Archaeologists have studied the landscapes around Bronze Age hoards and found that they commonly have links with water, such as springs, rivers and the sea, or are buried on top of hills and places with good visibility. The St Erth hoards are an excellent example of this. All of the objects were buried on top of a hill overlooking the River Hayle. Rivers were an important means of transportation in the Bronze Age and lots of metal was imported from the Continent at this time. This might also explain why the hoards have foreign types of objects such as the axehead from France or the sword fragment from Central Europe. Objects from abroad were transported across the English Channel and probably moved through the landscape by the river systems. It’s possible the St Erth hilltop had some significance to those in the local area, perhaps linked to the ruling elites or marking a territory. Burying lots of objects could have been a significant event that formed part of a wider social practice in prehistory. 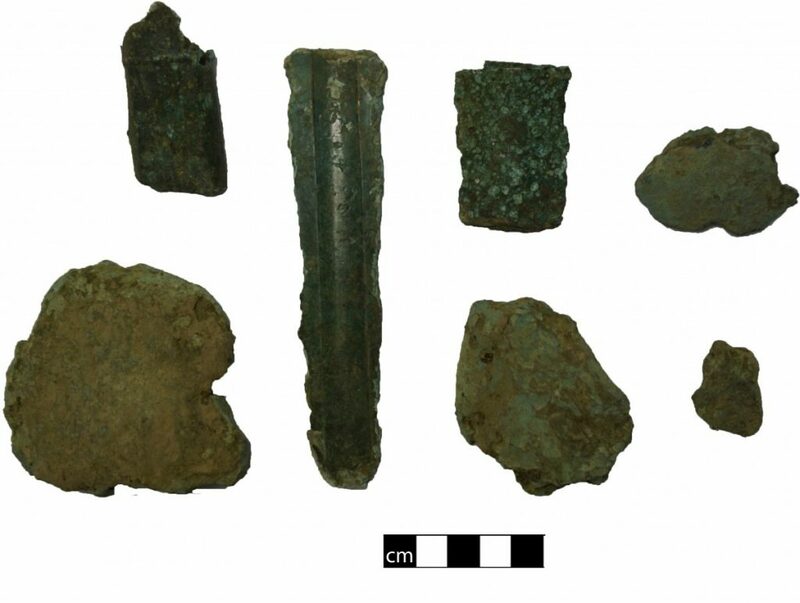 The St Erth hoards are not the only Bronze Age hoards in Cornwall. At the same time people were burying objects on a hilltop in St Erth, communities all across the south-western England were burying similar collections of objects on coastlines and hilltops. Other similar hoards have been found at St Levan and St Buryan and on St Michael’s Mount. At Breage, two hoards have also been discovered on a hilltop. 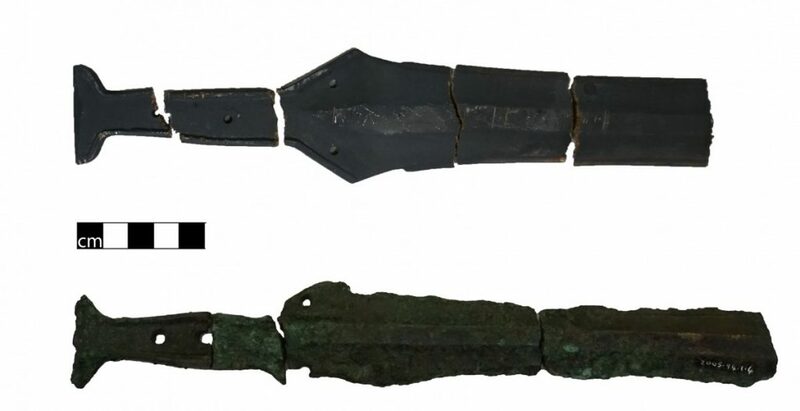 Overall more than 10 Late Bronze Age hoards of metalwork are known from the Duchy. All of them contain broken objects, usually including swords, axeheads and ingots. More have been found along the south coast of Devon. This all suggests that people had a wider idea about what objects should be collected for a hoard, how they should be treated, and where they should be buried. Where can I see these objects? The hoards were responsibly reported through the Portable Antiquities Scheme and declared treasure. They were then acquired by the Royal Institution of Cornwall and are on display at Penlee House Gallery and Museum in Penzance.